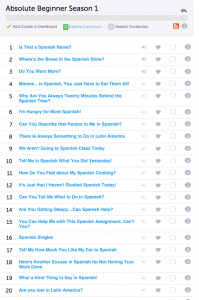 The learning program on Spanishpod101 offers two different options to study Spanish. You can choose the corresponding lesson from your Dashboard or you can choose one yourself, depending on your learning goals. I would suggest you try the Dashboard first, since it offers the Spanish lessons on a consecutive and easy to follow order. 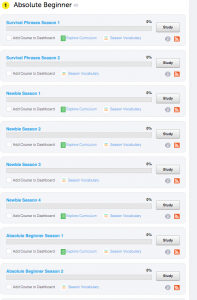 Your Spanish Pod101 personalized dashboard will also keep a record of the lessons you have already learned and the ones you still haven’t gone through, and it will even recommend specific lessons for you, based on the Spanish level that you are studying. Once you select the appropriate Spanish level, you will see a package of carefully designed lessons that deal with different topics. 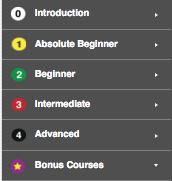 You can choose to take the lessons in order or pick just one, depending on the topics you are interested in learning. If you want to know more about the content of a specific Spanish lesson, you can click on the “Explore Curriculum” link, at the top of the lesson’s list. This will open a chart that explains the lesson´s topic, function, conversation insight, cultural insight, vocabulary, expressions and grammar. This way you will know exactly what you are learning. I found this to be particularly helpful. I was trying to learn specific vocabulary for a business trip to Latin America, and I wanted to concentrate only on the lessons that included these words, so I chose my lessons from the list and worked on them first. There is another option to check how you are doing on your Spanish learning process that I find very convenient. While you are on your personalized dashboard, click on the level that you want to review on the dark column, at the right side of your screen. You will see a chart that displays your advance for every season, instead of every lesson. 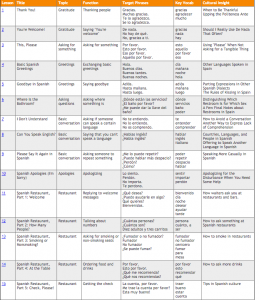 The “Explore Curriculum” option in this chart shows target phrases and key vocabulary used for the entire Spanish season, which is also very helpful.